Rarely do I start a post with a before picture, but then again, it’s not every day I have such a transformative renovation. Certainly I’ve been talking about it long enough, so it’s time to reveal my brand spanking new butler’s pantry. I’ve wanted a butler’s pantry for the longest time and when we decided to move this past spring, it was high on my list of extras I’d love to find. While I didn’t find a home that included an existing one, our home provided a golden opportunity – a space next to the dining room that I immediately envisioned renovating from storage closet to a dream butler’s pantry. This is the closet as it looked before we moved into our home. Given that we already have a pantry closet in our kitchen and plenty of other storage space, I didn’t think it was necessary to have a closet in such a prime spot to house lightbulbs and paper towels. It’s proximity to the dining room also made it the perfect place to gather my many sets of dishes and other tabletop accessories. With my vision clear, I set about making it happen. Here’s a glimpse at the final product before it was styled and decorated. I might have saved this for the end of the post but I wanted to show the before and after right next to each other, so you could get a real feel for how much it was transformed. I’ve decided to do this reveal in two parts to avoid a very long post, so today I will cover the renovation and my next post will show what the room looks like now that it’s completely done with the ‘pretty’ added in. We started with this basic closet when we moved into the house. I saw it’s potential right away and frankly never even looked at it as a closet that ever existed. To me it always was what it would ultimately become. I saw past the cheap shelving, the off center utilitarian light fixture and the builder’s grade door. Communicating that vision to others, however, was where I needed to concentrate. I couldn’t understand why people kept asking me why I wanted to put cabinets in the closet. To give you a sense of context, here’s a view towards the closet, as seen from the original dining room. The closet is the closed door that’s right outside the dining room. It’s very convenient in its location adjacent to the room where we entertain so often. It also can be seen when one enters the front door (not shown) and looks to the left down the long hallway. 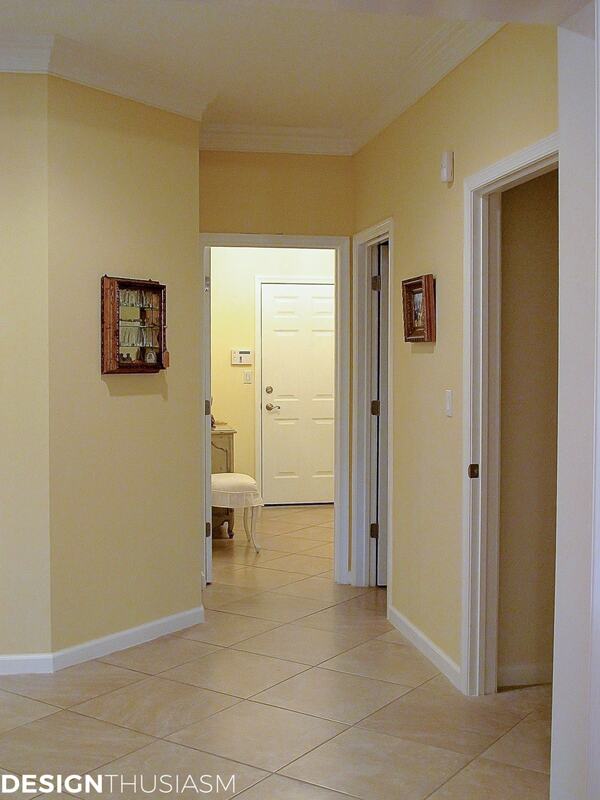 I loved the idea of looking down that hall and seeing a pretty serving space. 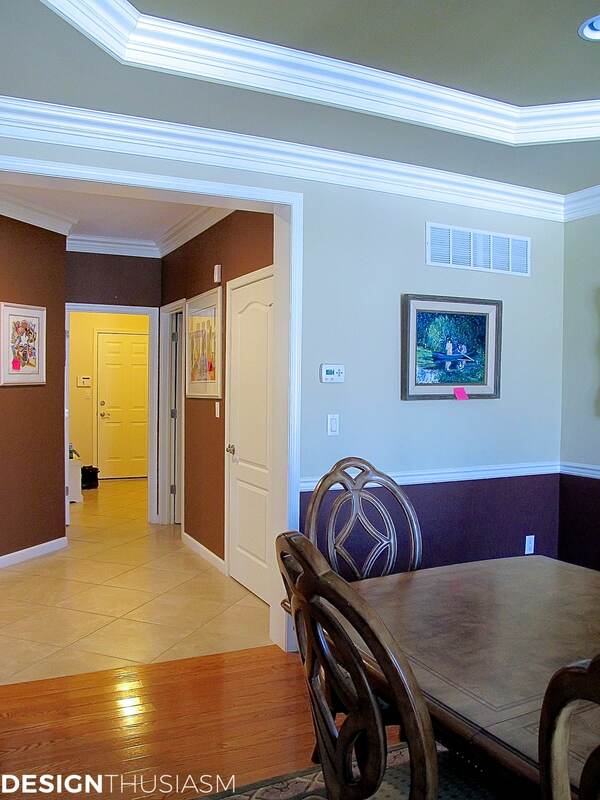 Once we moved in and painted the walls that same view changed to a lighter and cheerier look. We also lightened up the dining room, painting it a rosy blush pink, which lent itself nicely to our French influenced furnishings. 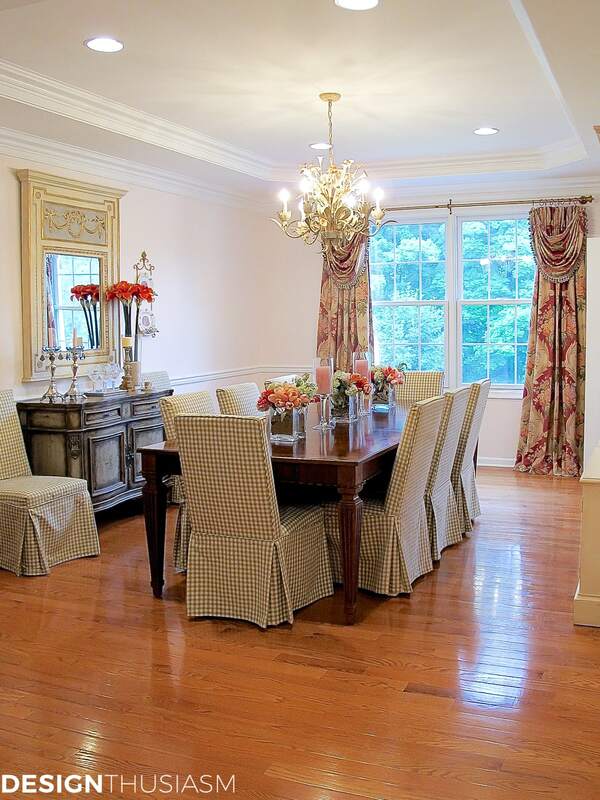 You can get a more detailed look at the dining room in A Rosy Dining Room. The next thing we did was take the door off the closet and started fulfilling my vision. 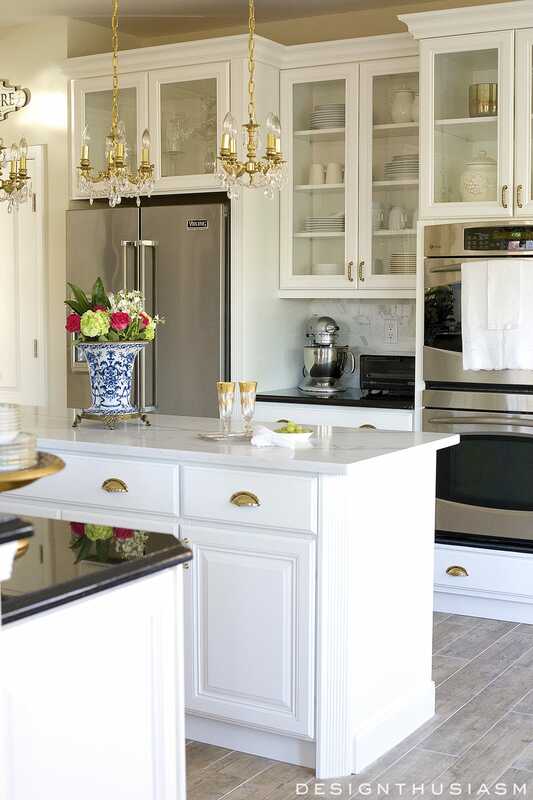 The first thing to go in was the cabinetry and the layout was as simple as could be. 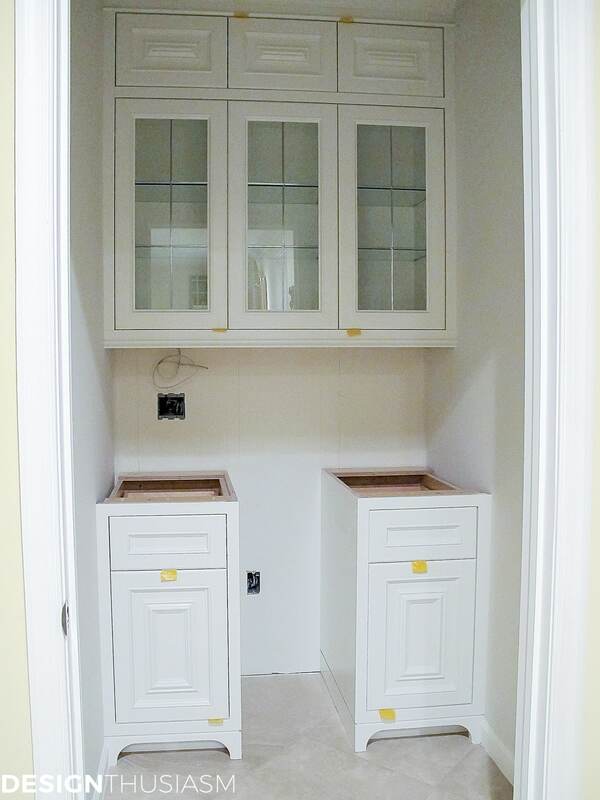 We ripped out the shelving and had cabinets made that would fit simply across the width of the former closet. The space is 51″ wide, so I opted for three doors with glass panes above the counter and raised panel doors beneath it. We left the center open on the bottom to accommodate a small wine captain. 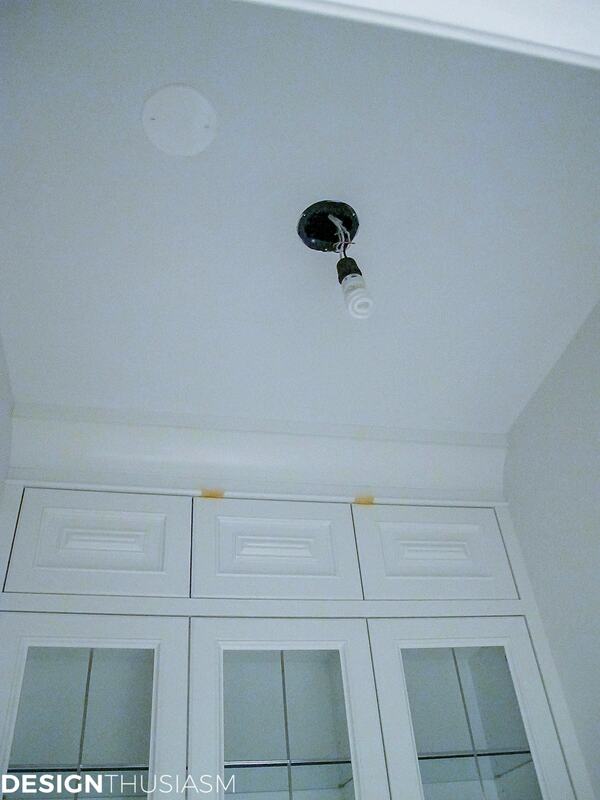 For the finish on the maple cabinets I selected Benjamin Moore White Dove. 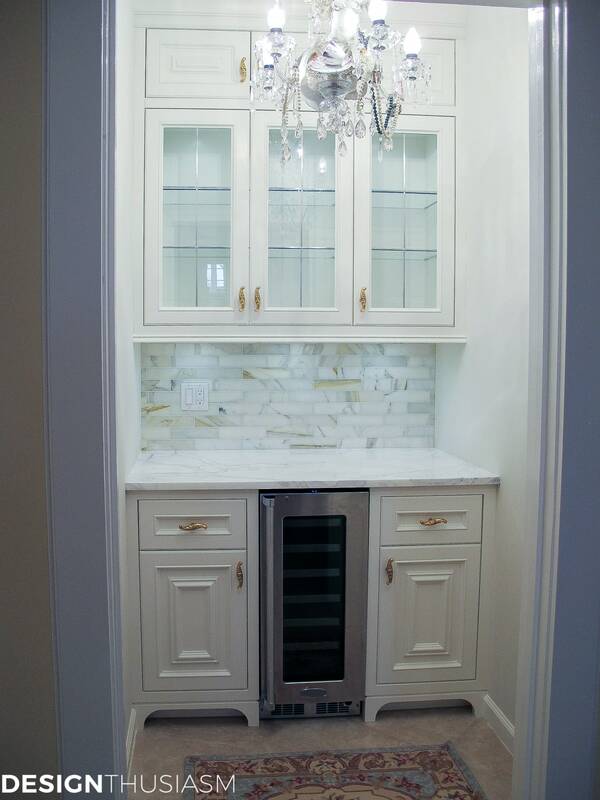 We needed to wire the space for the wine cooler and the cabinet lighting, as well as centering the curiously off center existing overhead. I knew exactly what fixture would go in here and it definitely needed to be centered. Next up was the counter and I knew precisely what I had in mind. 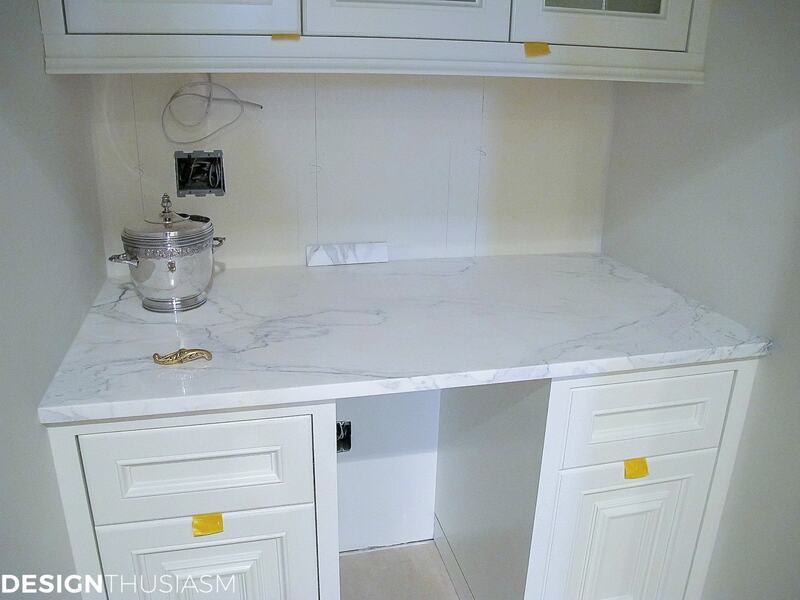 I headed to a local marble yard where I found a ‘remnant’ of polished calacatta. I did think twice about the durability of white marble but I’ve been certain about this combination for so long that I decided not to sell out. The space is tiny and worth the risk to go for the material I had my heart set on. I do hope to re-do my kitchen soon in a very similar color palette, but perhaps in there I’ll be more practical. For my tiny pantry however, I unabashedly followed my heart. Delightfully, it was time to approach the backsplash, which again I knew unequivocally what I wanted (this was my favorite part). I chose an exaggerated subway tile pattern in calcatta gold marble. I love how the gold from the pulls brings out the warm undertones in the marble. 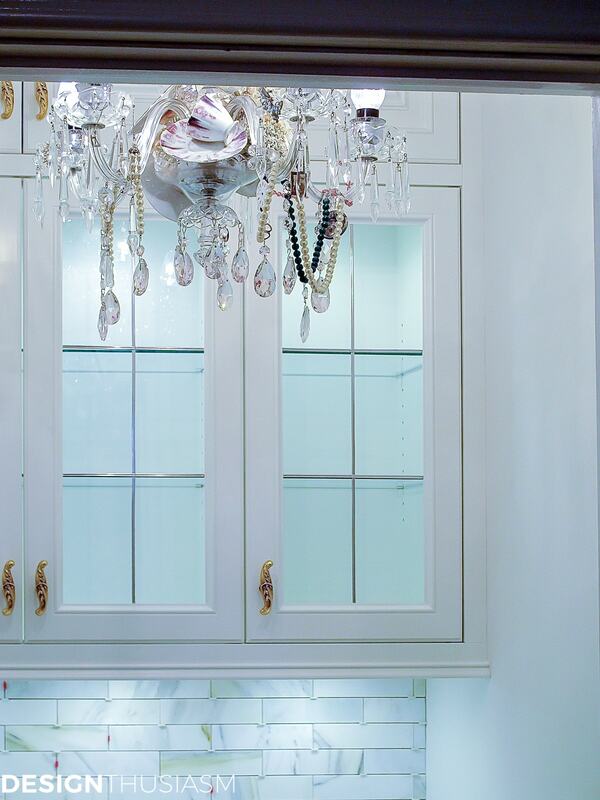 We put lighting inside the glass cabinets, as well as under cabinet lighting for the countertops. The cabinets have glass shelves and lead strips on the glass door panes. The fixture I had that works perfectly in here is the vintage one that used to be in my dining room. 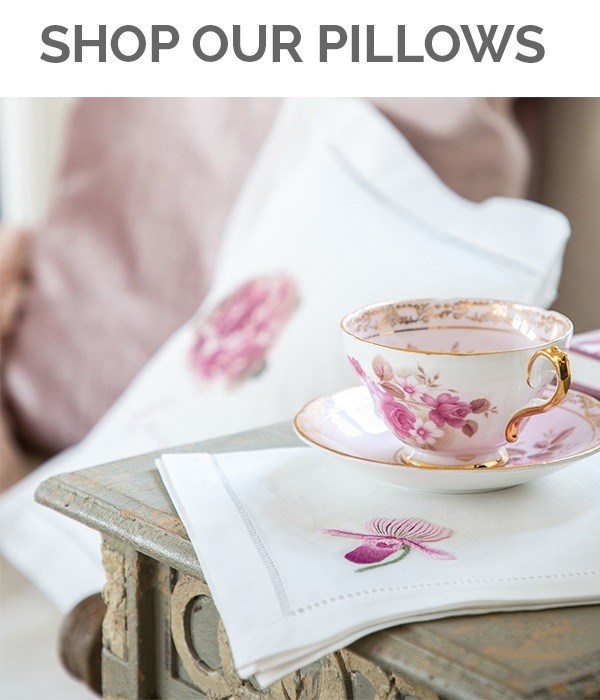 You can read about its provenance HERE but I knew the teacups that embellish it worked conceptually with the use of this room, as well as aesthetically with the look. and a closeup of the cabinet door reveals some lovely furniture detailing that my cabinet maker made sure to include. 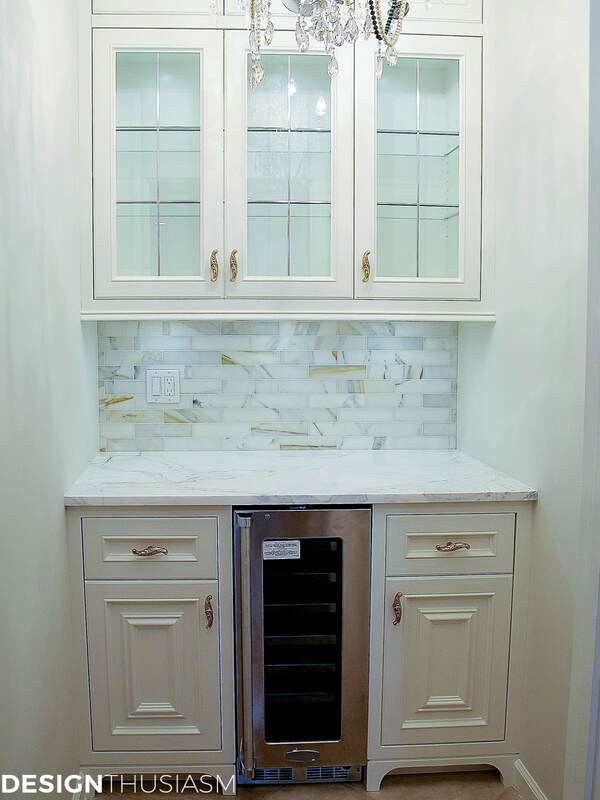 Lastly, in went the wine refrigerator and it was almost time to toast our new butler’s pantry! Gosh, just beautiful! I particularly love the tile you used. What a great use of this space! OMG ~ I’m in love. It’s beautiful ~ Somehow I thought it was part of your Dining Room – Your last picture really shows how it truly looks. I love the molding around the door. But I love the entire pantry…….You have to be thrilled with the end results. 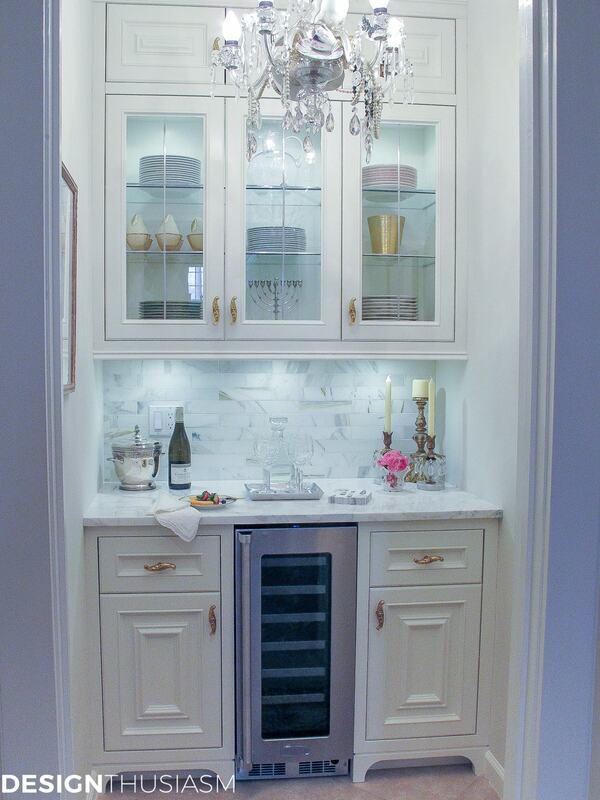 I have serious butler pantry envy Lori, it’s just gorgeous! The chandy is over the top, I am crazy about that! Adding the additional moulding above the door is very brilliant too, it is the virtual icing on the cake! Enjoy! Aw, thanks, Jenna! This project has been a long time coming, so we are enjoying it… 🙂 It’s lovely to put the lighting on and have it glimpsed as one enters the house – kind of a yellow brick road towards the wine! 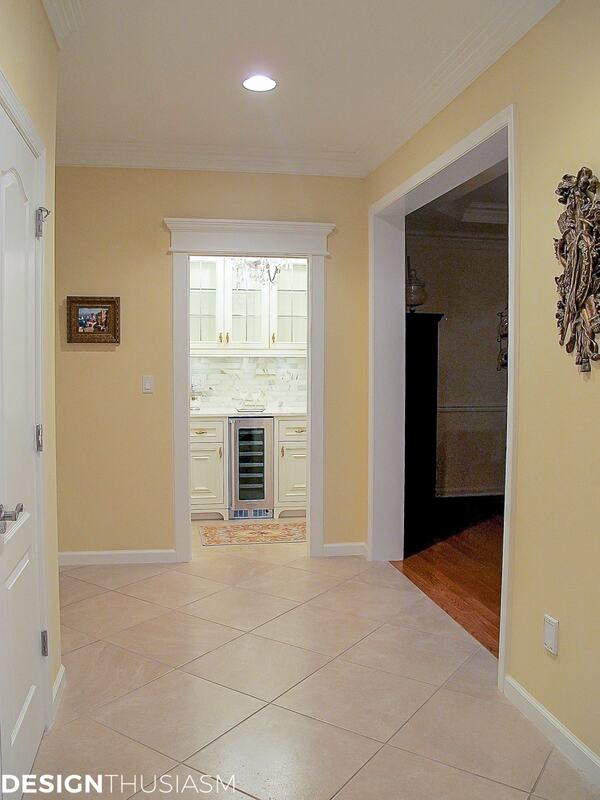 Amazingly beautiful job on your butler’s pantry makeover. Your selections are perfect. I WOULD NOT change the flooring. I think it would chop-up the flow. Your current floor is lovely and helps to make the pantry look as though it’s always been there, not a re-do. The continuity of the flooring just add to the beauty. Thank you so much! Just to clarify, the plan is to change the flooring for the *entire* entry, so it would flow exactly as it does now, only in a nicer material… 😉 That’s why we haven’t done it yet. I completely agree about not chopping up the space. If it was just the tiny pantry I would have done that first, but the space it connects to is quite large (including the mudroom and powder room next to it) so it didn’t fit into the budget just yet. Hopefully soon… 🙂 Thanks for visiting!! Looks beautiful and what a great use of space. Our butler pantry had been taken out of the house and during renovation we found the original footprint and put it back. It is so convenient when we have large gatherings to have the food in the space and out of the messy kitchen. I know you will enjoy yours as much as I do mine. It really is stunning and I so admire your vision for the space. Beautiful work! Thanks so much! I truly hope I can do the same for the kitchen, but that will be a much larger project and needs to wait a bit. Maybe soon… 😉 Thanks for stopping by!! Absolutely gorgeous! 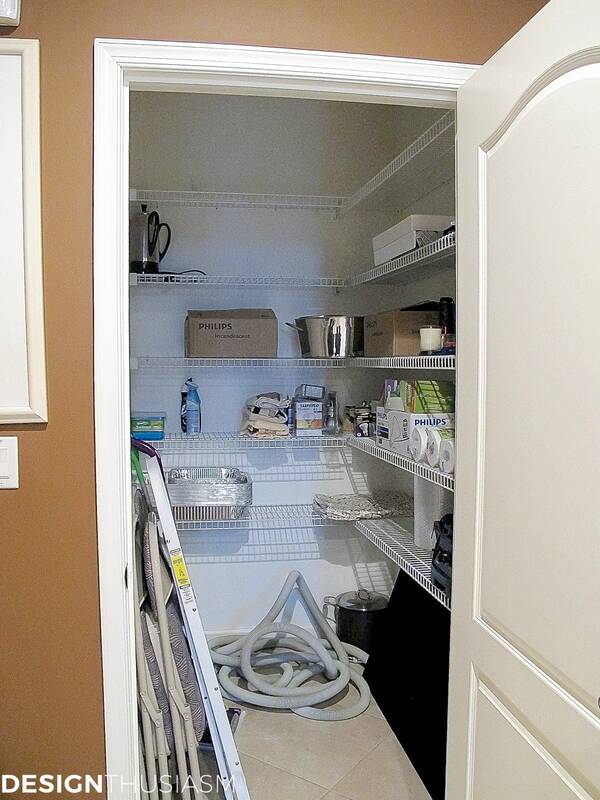 What a brilliant idea to make over the closet into a butler’s pantry. Every detail is exquisite. I had to pin it to my Dream Home board. Thanks so much, Donna! Thanks for pinning, as well… 🙂 I have a complete butler’s pantry board on my Pinterest page that I used for inspiration all the way through this project. Probably should add my Pinterest page into the post… lol. Lory, your reno is just fabulous–I love EVERYTHING! I would have done the same thing, not having to worry about needing the closet for storage, and did do the same in our previous home where we were fortunate to have a big walk-in storage closet between the dining room and eat-in part of our kitchen, which allowed us to keep china and large kitchenware items to utilize for both rooms. It was so convenient. I have lots of kitchen cabinets and drawers in our present home, but not enough, even with giving china sets away to our children, to house all our china (mainly all the glassware that goes with them), so we store some of the least used holiday china in basement cabinets and keep most of the glassware upstairs. It’s not really difficult for hubby and I to bring things up on those rarer occasions…..nevertheless, a big butler’s pantry is included in our retirement house plan and, like you, I can’t wait to decorate it! I am really enjoying your home transformation, as I love all your design ideas Hugs! Like all you do this is lovely and classy! My pleasure, Elizabeth… 🙂 Thank you for the lovely comment! This is a wonderful transformation. I have a closet under our stairs that’s in our dining room. I’ve often wondered if I could turn it into something far more useful and pretty. 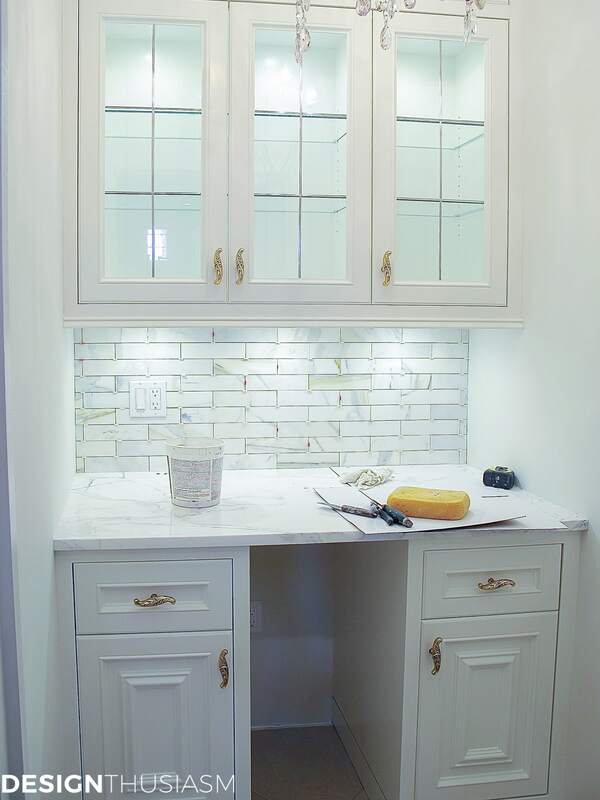 The white marble counter with your tile and cabinet pulls and light fixture is wonderful. I’ve just recently found your blog and enjoy everything about it!! Thank you, Pam!! I’m delighted you found me and are enjoying… 🙂 I can’t thank you enough for taking the time to leave a comment. And, yes, I’m certain you can do something with your under-stairs closet. I’ve seen serving bars or that sort of thing done with that type of space, which would essentially be the same thing as the pantry only without the side walls. Enjoy your next project!! Wonderful choices! The marble slab is outstanding, as is the hardware which looks so good both vertically and horizontally. You have no idea how much I would love to do this to my current laundry room which I would relocate to the garage If only I could get the husband on board I’d be in business. Ha ha, thanks, Ellen! Yes, hubby was one of the people who really wasn’t sure what or why I was planning what I had planned, but I was so driven about this one that I guess he just trusted me… 😉 It helped that we were moving to a new home and it was in the plan (well, ok, *my* plan) from the start, so was budgeted that way. Thanks for stopping by! What a lovely and great idea for the use of that space. It looks grand already, can’t wait to see the finished product. 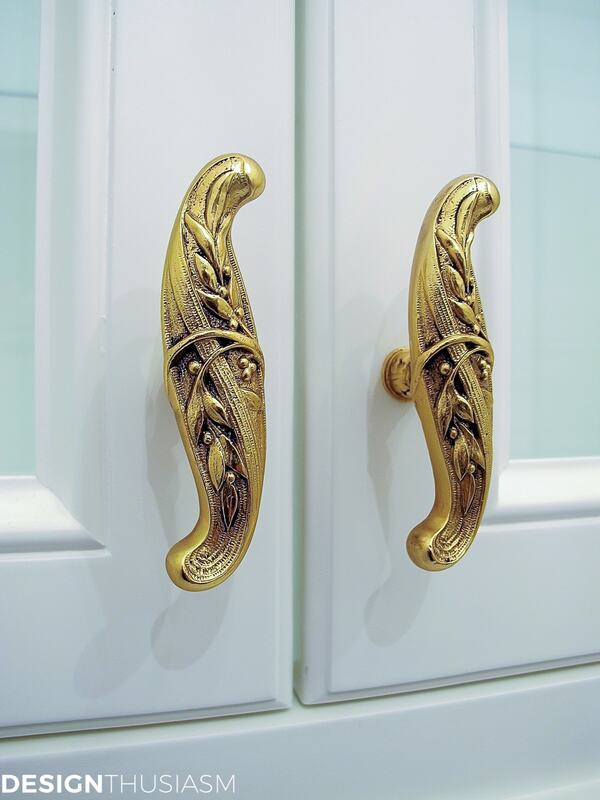 Your cabinets are gorgeous and love the hardware you chose, so elegant and perfect for what they will be housing. Thank you so much, Nellie! 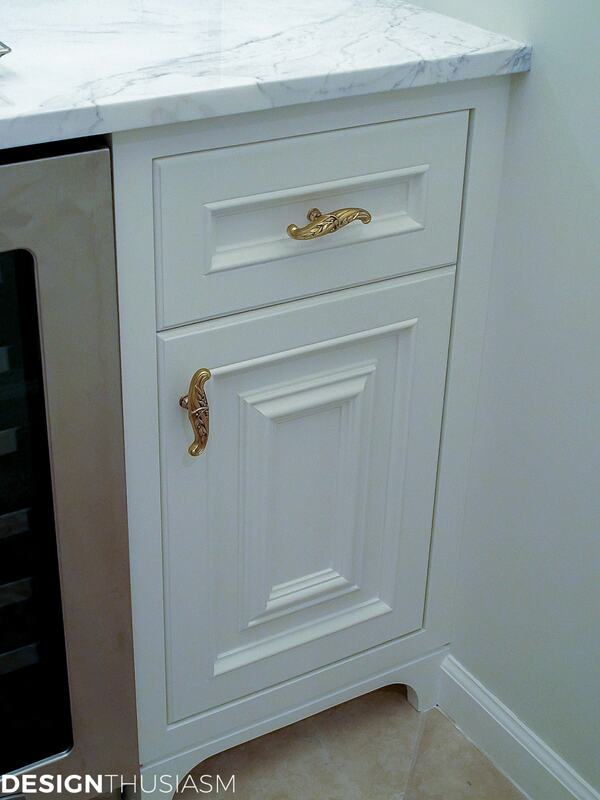 It’s a pleasure to share my visions with like minded people… 🙂 I was lucky to work with a wonderful cabinetmaker on this project, so that helped. Thanks for stopping by! It’s gorgeous!! I’m so jealous. I love the gold in the tiles and the hardware. Can’t wait to see it “decked out”. What a fabulous make over! Wow, and to think it use to be a closet. I love the tea cups on your chandelier. It all came together just beautiful for you. Enjoy! Thanks, Jeanie!! Yes, I was so thrilled when I realized the potential for this closet. And it was small enough to make it attainable… 😉 Thanks for visiting! What a breathtaking space you’ve created! It’s absolutely gorgeous! You have done an amazing job! I hope you have a great weekend! If you feel like linking up to one more party, Making Broken Beautiful runs every Thursday thru Sunday 🙂 I would be happy to have you come and inspire! Thanks so much, Terry! Sorry, I got so behind on my comments this week that it’s a bit late, but will try to pop over to the party anyway… 🙂 Thanks for visiting! I would not think to do something like that in a million year but I LOVE it. I’m going to have a look at all our cupboards now – see if I can see any potential that I couldn’t see before! Thanks, Julie!! I guess because it’s something I always wanted, I was just looking for the right spot to do it. The it was just a matter of making it happen… 🙂 Thanks for visiting!! Oh Wow, once we had a Butler’s pantry in a 1905 lumber baron house that had been made into the downstairs bathroom. I so craved to put it back to the original…but it wasn’t to be. This is gorgeous—and so practical…I’m sure you will use it..and the fixture is gorgeous—love the whimsy of it. Fun post, can’t wait to see the rest. Thank you so much! Yes, I would miss it too… 😉 The second post is up now. 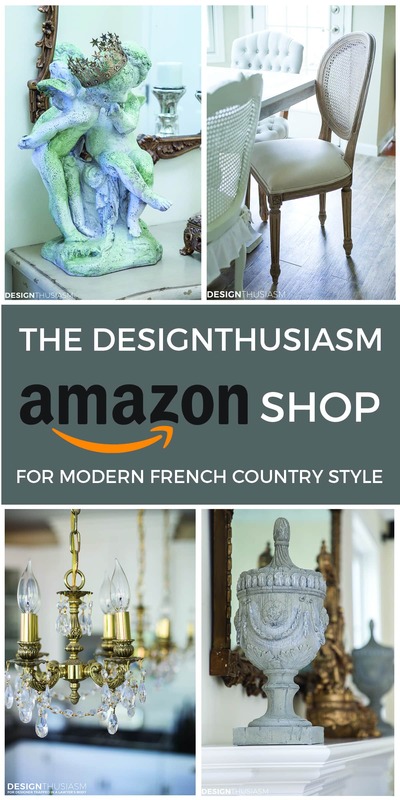 You can see it here: https://designthusiasm.com/french-styled-butlers-pantry/ Thanks for stopping by!! Really really beautiful! Glad you went with your dream and stuck with the marble! 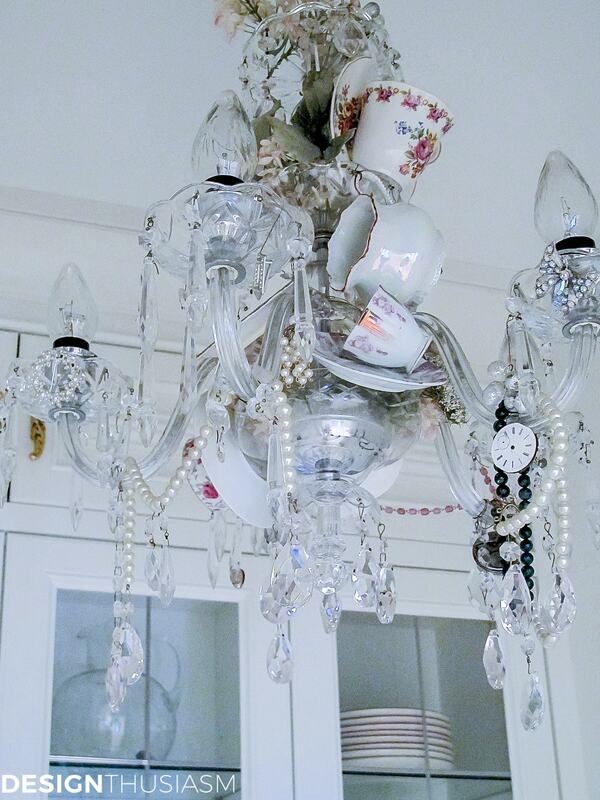 That chandelier is so much fun too with the teacups! Enjoy your new butlers pantry! Thank you, Angelina!! Yes, if there’s one thing I’ve learned by now it’s to follow my heart… 😉 Works every time!! Thanks for stopping by and taking the time to comment! What a great way to use the space!! I won’t forget the first time I discovered the reality of a butler pantry when “old house” shopping in my 20’s. Thanks for sharing! Thanks so much! I think my love for butler’s pantries comes from the same basic place. When we were looking for the home we brought our kids up in, the neighborhood was an older established neighborhood with elegant old world homes. I fell in love with that sort of home and really enjoy these kinds of nooks and crannies. Glad you enjoyed the post! Stunningly beautiful! What a great plan and execution! It’s beautiful. Great use of space indeed and it turned out amazingly! Nice job! I am in awe. It is beautiful. Unfortuneatly I have no closet to reform. I will have to remember yours. Thanks, Jody! Yes, I get that – I’ve waited all these years to have a space like that… 😉 Thanks for stopping by! Oh, this was fantastic all by its renovation period! But, then you had me with the teacups in the chandy! Absolute brilliance! I so love this! Featuring today at Home Sweet Home! Aw, thank you so much, Sherry!!! Lory, this has got to be the most gorgeous closet makeover I’ve seen yet. I’m featuring it this weekend at the DIY Sunday Showcase Party! Oh wow, thank you so so much, Marie!! Looking forward to another party… 🙂 Thanks for hosting! That is so gorgeous! I love the hardware so much. The whole thing is stunning but the hardware made my jaw drop. What a great idea! I want to redo our small linen closet in the hallway into something more functional…nothing this grand. My little linen closet is only a little wider than a paper towel roll. It’s useless. This has inspired me so much. Thank you so much, Nancy! 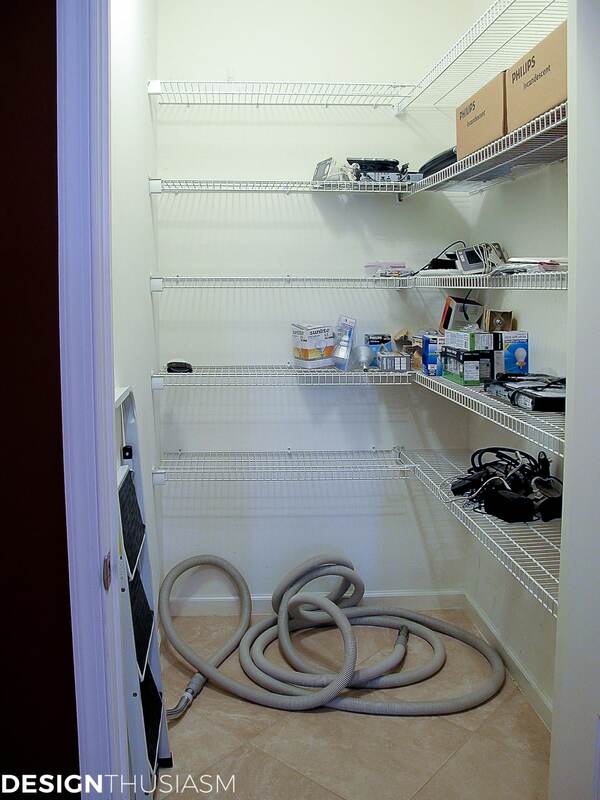 Yes, I was pretty excited when I found that hardware… 🙂 Re your linen closet, it sounds like it might be sized similar to an area I had in my master bath in my last house. We did a cabinet on top and then an open space above the counter where I kept my perfumes and then a closed cupboard below. It could actually be quite similar in materials to my butler’s pantry, but just way smaller. You can get a partial glimpse of what mine looked like in this post – the 5th photo down: https://designthusiasm.com/relaxing-master-bath-add/ The cabinets are not as nice as what I did in the pantry, but hopefully you can get a sense of it. Thanks so much for visiting!! Awesome butler’s pantry you did. Great use of this little space and your dining room is stunning too. WOW!! I seriously can’t believe what you did with that space! Job well done – it’s like a whole extension to your kitchen! Thanks so much!! Yes, actually, I can’t wait to renovate the kitchen to look more like this… 😉 Thanks for stopping by! What a great vision you had. The room turned out quite fantastic. Love the marble countertop and tile! Stunning butler’s pantry!!! Fabulous idea. I adore the chandy. It is perfect for your room. Can’t wait to see all the dishes in the cabinets. Gorgeous, such a fabulous idea. 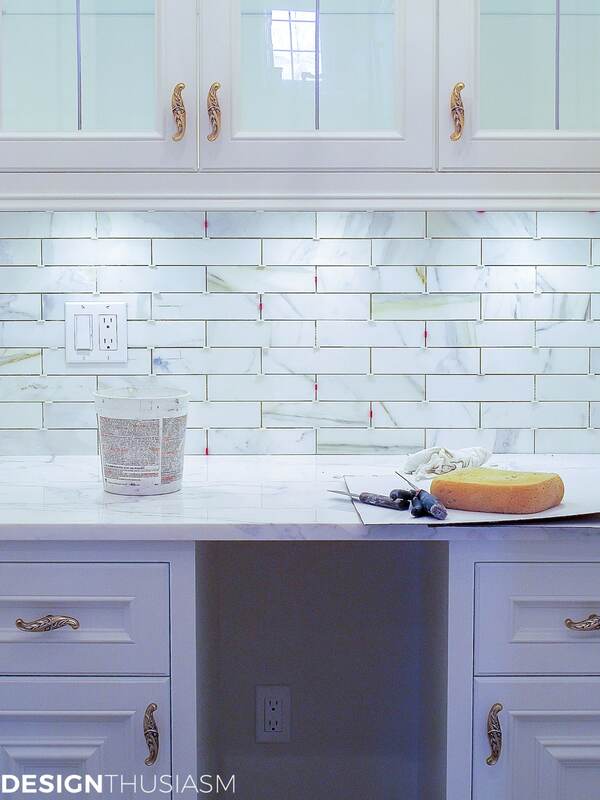 Love the pulls and the backsplash. Be sure to show us your dishes when you have it ready. Fabulous! Wow! I am speechless. Sooooooooo nice! Love, love, love this! The chandelier is beyond awsome! Just found your blog. Congrats on an amazing transformation. I’m slowly working on my 160 year old house in NC. The yellow in your hall is lovely, may I ask what color it is? Thank you so much, Caroline, and welcome!! How fun to be working on an old house… 🙂 The yellow in the hall is Benjamin Moore Mushroom Cap 177. Thanks for visiting! Lori, this is a beautiful space. I particularly adore the chandelier ! ! I would never have thought of cups and saucers, with pearls and other lovelies. Just wonderful ! !